From the very beginning of the great controversy in heaven it has been Satan's purpose to overthrow the law of God. "-Ellen G. White, The Great Controversy, p. 582. Why? Because the law, as the foundation of God's government, expresses the moral integrity of the cosmos; and to overthrow that law would be to overthrow the moral order of the creation itself. Think about it. If no god existed, and no life either, the universe would be amoral. Not immoral, as in having bad morals, but amoral, as in having no morals, because nothing in it-such as lifeless rocks hurling through a godless cosmos-could manifest moral qualities. However, God exists, and humans do as well, and we have been created as moral beings with the capacity to give and to receive love. For this love to exist, however, freedom, moral freedom, must exist too, because love is a moral concept that couldn't arise in an amoral universe (such as one composed of only rocks and cold space). Morality, though, means the ability to choose right or wrong, good or evil-and the only way for the universe to be moral, to allow the potential for good or evil, for right or wrong, would be for it to have a law that defines right or wrong. And, of course, it does have such a law. What shall we say, then? Is the law sin? Certainly not! Indeed I would not have known what sin was except through the law. For I would not have known what coveting really was if the law had not said, Do not covet. (Rom. 7:7, NIV). Is it sinful to have red hair? Why not? Because God's law doesn't forbid red hair. If it did, as the law forbids covetousness, then having red hair would be sin. But it cannot be sin if no divine law defines it as such. Morality without law is as impossible as is thought without mind. Our universe is moral because God created free beings answerable to His law. If there were no law against coveting, there would be no sin of covetousness; if there were no law against red hair, there would be no sin of red headedness-no matter how many red-haired coveters populated the cosmos. God created humans as creatures who can love. Love, though, can't exist without freedom, moral freedom. And moral freedom can't exist without law, moral law. Love rests on freedom, and freedom rests on law. Hence, the core of God's government, the foundation of that government-a government of love-has to be His law. That's why Ellen G. White wrote what she did about Satan's desire to overthrow the law of God. The attack on the law is an attack not just on Christ's character but on the moral order of the creation itself. Hence, the topic for our quarter: Christ and His law. We will study the law, especially the question of why so many Christians-misunderstanding the relationship between law and grace-have fallen into the trap of denying the continued validity of the Ten Commandments, thus, unwittingly helping the attempt to overthrow God's law. The Bible, though, is clear: For this is the love of God, that we keep His commandments (1 John 5:3, NKJV). The link between our loving God and the keeping of His commandments is stronger than we realize. We can love God because we live in a universe where love can exist, and it can exist because the universe is moral. That morality is based, at least for us as created beings, on God's moral law-the subject we will now explore. Keith Augustus Burton is a professor of religion at Oakwood University where he also serves as the coordinator of the Center for Adventist-Muslim Relations. His doctoral dissertation from Northwestern University focused on the role of the law in Paul's letter to the Romans. Read for This Week's Study: Luke 2:1-5, Heb. 10:28, Deut. 17:2-6, Lev. 1:1-9, Luke 14:1-6, James 2:8-12. Memory Text: For when Gentiles who do not have the Law do instinctively the things of the Law, these, not having the Law, are a law to themselves (Romans 2:14, NASB). In most societies, various laws function at the same time. There can be general laws that apply to everyone and, simultaneously, local laws that prevail in one community but not in another. In New Testament times, when a person used the common word for law (nomos in Greek, lex in Latin, and Torah in Hebrew), he or she could have been referring to any one of a number of laws. Often the only indicator as to the exact law being discussed was the context of the conversation. Thus, as we study this quarter we'll always need to keep the immediate context in mind in order to understand best what law is being discussed. This week's lesson investigates the various laws that functioned in the community during the time of Christ and the early church. We will study these various laws but only in the context of helping to set a foundation for the study of the law that will be the major focus of this quarter-God's moral law, the Ten Commandments. Read Luke 2:1-5. What lessons can we learn from the ways in which these two faithful followers of the Lord interacted with their political environment? Since the time of the early republic, the Romans recognized how important written laws were for the governance of society. In fact, the system of constitutional law established by the Romans remains a foundation of the legal systems found in many of today's democratic societies. For the most part, Rome allowed vassal kingdoms to maintain their own customs, but all subjects were expected to obey imperial and senatorial laws. Obviously, this included Joseph and Mary. Roman law was concerned with order in society. As such, it not only addressed issues of government but also legislated behavior in the domestic arena. In addition to stipulating the procedures for selecting people to public office, Roman law also dealt with things such as adultery and master/slave relationships. Many of the social codes are similar to the ones found in the Old Testament and other societies. All attempts to understand the culture in which the New Testament books were composed must take into account the fact that the Roman Empire formed the political backdrop for the world in which Jesus and the early church lived. Many things taking place in the New Testament, from the death of Jesus to the imprisonment of Paul, make much better sense when we understand whatever we can about the environment of their times. Of course, one doesn't need to be a scholar of Roman history in order to understand that which we need for salvation. However, when it is possible for us to obtain it, historical knowledge can indeed be helpful. Although the Jews were under Roman rule at the time of Jesus, they were granted authority over those issues that were unique to their customs and religion (see Acts 18:15). The legislative body responsible for administering Jewish law was called the Sanhedrin. Sometimes referred to as the council (John 11:47, Acts 5:27), the Sanhedrin consisted of 71 men selected from among the priests, elders, and rabbis and was presided over by the high priest. It served as a type of Supreme Court that dealt with Jewish customs, traditions, and laws. Jewish societal law was founded upon the civil codes revealed in the five books of Moses. Because Moses was the author of the first five biblical books, the laws are referred to as the law of Moses. When God originally gave the laws to Moses, He envisioned a state where He would be the head and the people would enforce His legal mandates. By the time of Jesus, the Jews were subject to Roman law. However, the Roman government allowed them to use Mosaic law in order to settle issues relating to their customs. Here is where the work of the Sanhedrin was especially important. The New Testament provides several examples of the Mosaic law being applied, or alluded to, in civic matters: Jewish men were still expected to pay the half shekel temple tax (Matt. 17:24-27, Exod. 30:13); divorces were still being governed by the stipulations set forth by Moses (Matt. 19:7, Deut. 24:1-4); people still adhered to the law of levirate marriage, in which a widow was to marry her husband's brother (Matt. 22:24, Deut. 25:5); boys were still circumcised on the eighth day (John 7:23, Lev. 12:3); and adulterers were to be punished by stoning (John 8:5; Deut. 22:23-24). Read Matthew 26:59-61, Hebrews 10:28, and Deuteronomy 17:2-6. What important principle is seen here? What does this tell us about biblical concepts of justice and fairness? Read some of the civil legislation found in the early books of the Bible. Some of those laws do seem strange to us, don't they? (See, for example, Deuteronomy 21 .) Considering who the Author of these laws is, what should this tell us about how we must learn to trust the Lord in all things, especially those things we don't fully understand? Read Leviticus 1:1-9, 2:14-16, 5:11-13. To what are these laws referring? What was their purpose? What important truths were they meant to teach? Besides the civil laws in ancient Israel, there was also what is often called the ceremonial law. This law centered around the sanctuary and its services, all of which, of course, were designed to teach the children of Israel the plan of salvation and point them to the coming Messiah. In the texts for today, twice it is mentioned that through these services atonement would be made. In their own way, these laws were what has been deemed miniprophecies of Christ and His work of atonement for the sins of His people. 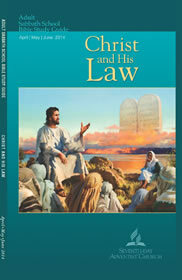 The ceremonial law was given by Christ. Even after it was no longer to be observed, Paul presented it before the Jews in its true position and value, showing its place in the plan of redemption and its relation to the work of Christ; and the great apostle pronounces this law glorious, worthy of its divine Originator. The solemn service of the sanctuary typified the grand truths that were to be revealed through successive generations. . . . Thus through age after age of darkness and apostasy faith was kept alive in the hearts of men until the time came for the advent of the promised Messiah. -Ellen G. White, Patriarchs and Prophets, p. 367. Though instituted by Jesus, the ceremonial system was meant to function only as a type, a symbol of a future reality-the coming of Jesus and His death and High Priestly ministry. Once He completed His work on earth, this old system-along with its sacrifices and rituals and feasts-no longer was needed (see Heb. 9:9-12). Though we no longer keep the ceremonial law today, by studying it we can garner insights into the plan of salvation. Central to the sanctuary service was the sacrifice of the animals, which pointed to the death of Jesus. Think what it means that our salvation could come only through His death in our behalf. What should this tell us about just how costly sin is? In addition to the Mosaic laws, Jews at the time of Jesus were also familiar with the law of the rabbis. The rabbis were the scholastic arm of the Pharisees, and they took the responsibility of ensuring that the Mosaic law remained relevant to the people. The rabbis counted 613 laws in the five books of Moses (including 39 pertaining to the Sabbath), and they used these laws as the basis for their legislation. They supplemented these written laws with an oral law that consisted of the interpretations of leading rabbis. Oral law is known as halakah, which means to walk. The rabbis felt that if the people adhered to their numerous halakoth (plural of halakah), they would walk in the way of the 613 major laws. Although originating as oral law, the rabbinic halakoth were collated and recorded in book form. Some of the interpretations from Jesus' day survive in commentaries known as Midrash, while others are recorded in a legal collection called Mishnah. Many religious Jews through the ages, and even today, seek to adhere strictly to these laws. Read Luke 14:1-6 and John 9 . Although Jesus was accused of violating the Sabbath with His miraculous healings, where can you find in the Old Testament that it's a sin to heal on the Sabbath day? How does the answer help us to understand some of the issues with which Jesus had to deal? More important, what lessons can we learn from these incidents that could help us to make sure that we don't make similar mistakes in our attempts to seek to walk in the way faithfully? Though it's easy from our perspective today to deride many of these oral laws, especially when they were used as they were against Jesus, the fault exists more with the attitude of the leaders and not with these laws themselves. Though often kept very legalistically, halakoth were meant to be very spiritual, infusing a spiritual element into the most mundane of actions, giving them a religious significance. How can we learn to give even the most mundane tasks a religious significance? However much Roman law, Mosaic law, and rabbinic law impacted the lives of Jews living in first-century Israel, many people who followed the religion of Israel lived outside of Palestine and beyond the borders of the Roman Empire. Thus, many of these laws would not have played a big role in their lives. At the same time, however, anyone professing to be a follower of the God of Israel would have adhered to the Ten Commandments. The Ten Commandments provide Israel with the moral framework for maintaining it. The metaphor that the Bible uses to express this relationship is covenant. While the metaphor comes from the sphere of international law, it is wrong to understand the commandments merely as a summary of Israel's obligations toward God. . . . Israel's obedience to the commandments was not a matter of submission to the divine will as much as it was a response to love. -Leslie J. Hoppe, Ten Commandments, Eerdmans Dictionary of the Bible (Grand Rapids, Mich.: Eerdmans, 2000), p. 1,285. The Ten Commandments surpassed any system of law known to Jews in the first century. Even the Pharisees, who had meticulously memorized the 613 Mosaic laws, recognized the importance of the Ten Commandments. The division of the Mishnah called Tamid (5:1) contains a rabbinic command to recite the Ten Commandments daily. It was believed that all the other laws were contained in the Ten Commandments. In fact, the Jewish philosopher Philo, who was a contemporary of Jesus, wrote an entire book on the central place the Ten Commandments held among all biblical law. Read Matthew 19:16-19, Romans 13:8-10, and James 2:8-12. What do these verses say about the role that the Ten Commandments played in the lives of those who are followers of Christ? Like their Jewish counterparts, the inspired writers of the New Testament recognized the purpose of the Ten Commandments for God's people. Although some of the lessons for this quarter will discuss the way in which Christ interacted with other systems of law in His day, the primary emphasis will be on His relationship to the Ten Commandments-what is often known as the moral law. Further Study: Read also Ellen G. White, Oath Taking, pp. 201-204, Testimonies for the Church, vol. 1. If Adam had not transgressed the law of God, the ceremonial law would never have been instituted. The gospel of good news was first given to Adam in the declaration made to him that the seed of the woman should bruise the serpent's head; and it was handed down through successive generations to Noah, Abraham, and Moses. The knowledge of God's law, and the plan of salvation were imparted to Adam and Eve by Christ Himself. They carefully treasured the important lesson, and transmitted it by word of mouth, to their children, and children's children. Thus the knowledge of God's law was preserved. -Ellen G. White, Selected Messages, book 1, p. 230. Long before Moses penned the laws that were to govern Israel, the Egyptians and Babylonians had systems of societal laws that were, in some cases, similar in content to some of God's laws. Even atheistic societies have laws that protect people and property. Law, though, is often based on moral concepts; that is, law should encourage people to refrain from certain types of evil and to do certain types of good. From where, though, do societies get their sense of good and evil? How does the whole concept of good and evil impact the question of God's existence? In other words, if there is no God, from where do the concepts of good and evil come? From where is the only place that they could come if no God existed? We often use the concept of law in different ways. We talk about the law of gravity, the law of motion. We talk about international law. We talk about the law of the land. We talk about tax law. What do all of these laws have in common? In what ways do they differ? What is the probable consequence of violating any of these laws? What are the benefits of cooperating with these laws? How do the principles of law help you to understand the purpose of the Ten Commandments as it relates to the life of believers? In class, go back to Wednesday's lesson and deal with the issue of how we as a church need to be careful that we don't make the same mistake that some of the leaders did by adding burdens to the law that were never meant to be there. Why is such a mistake easier to make than we might think, no matter how well-meaning we might be? 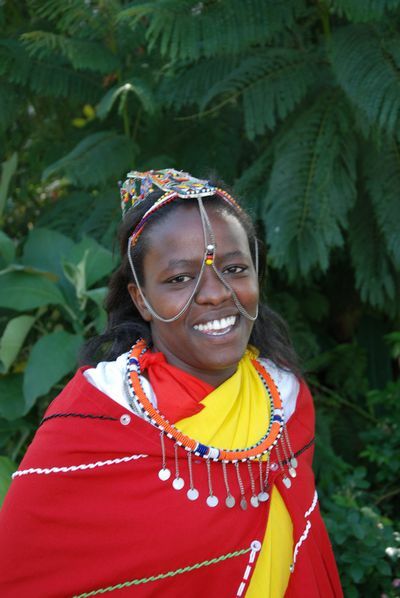 Elizabeth Kimongo was born into a traditional Maasai family in Kenya. In her culture girls are expected to marry soon after their twelfth birthday. Women have little to say about their lives, but Elizabeth refused to leave school to marry. She had a dream. While home for vacation before starting high school, Elizabeth learned that her father had arranged for her to marry an older man. With her mother's blessing, she escaped and returned to her Adventist school. During high school Elizabeth took her stand for Christ and later was baptized. When she told her mother that she wanted to study at the Adventist university, her mother encouraged her to go. Elizabeth is majoring in agriculture, a field that will help her teach her people how to preserve their land and provide a better life. She works on campus and receives some scholarship funds to help her pay her school fees. Sometimes she must take a semester off to work full time to earn the money to continue her studies. Elizabeth's example has helped her younger sisters stay in school and avoid early marriage. Her father, once angry that his daughter would refuse to marry the man of his choice, now accepts her decision. But he pressures her younger sisters to marry this man. Elizabeth encourages her sister to walk close to God and continue their studies to make a better life. Elizabeth urges other Maasai girls to study hard and trust in God. "Don't allow life's circumstances to steal your life away," she says. "Satan wants to destroy you. You must trust God and not let Satan have his way." Elizabeth is old enough now that her community will not force her to marry. They accept her as an adult woman who can make her own decisions. "I want to teach my people by example how to produce better crops for a better life," she says. "The village has given me a piece of land that I use to plant crops so that my fellow villagers can see for themselves the success they can have by following my example." Elizabeth is grateful for Adventist schools that have prepared her to live a life of influence among her Maasai people. Our mission offerings and Thirteenth Sabbath Offerings help these schools reach young people in all walks of life, including Maasai girls in the heart of eastern Africa. Thank you. Elizabeth Kimongo will soon complete her studies and return to her village to work for her people and share God's love among them.